As you know, BigBoy's first day of K was an emotional day for me and Sassy. So what better way to get our minds off the sadness in our hearts? Go Shopping! Go to Lunch! Shop some more! Sassy and I hit the road and headed up to the City. Girl Time I told her. "Girl Time? No boys?? Yeah!! Ha ha ha ha ha (think neener neener voice.)" Alright, game on. Let's see what this only child situation is like again. I needed to get some things for BB that I either a) couldn't find over the weekend or b) totally spaced. Mainly tennis shoes. I forgot the boy needed some sneaks for PE. BB doesn't wear tennis shoes. ever. It's Crocs in the summer and Fuggs in the winter--if he's wearing shoes at all. We walked into the shoe store and I quickly realized my mistake of taking Sassy with me. She raced down the crowded kid's shoe isle. "AAAAAWWWWW!!! Moooommy look! Pink! and 'parkley! and Piiiiiink! Ahhh!! and Princesses!!!! Oh Mommy. MY school shoes?? Deese for me???" And then she gave me The Look. You know the sweet, you-really-truly-can't-say-no-to-me look. And usually I can, really, truly say no to her. Usually The Look only works on the Daddy/Grandparent types. But not today. Not on the day my first born, my baby boy, left me. She had me. I caved. 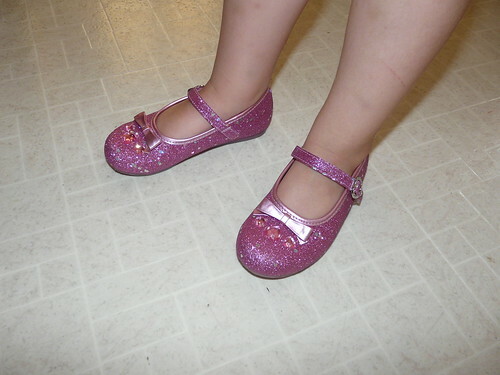 I got her the most gaudy pink, sparkley, princessy shoes you could ever dream of. And she loves them. So we have pink in our house. Lots and lots... and lots of pink. And dresses. And sparkles. And princesses. And to be honest, it is kinda fun to have tea parties and dress dolls and dance to Beyonce. Maybe I'll cave again and get Sassy a Bedazzler for her upcoming birthday. She might get sparkles on her toothbrush after all. Love the sparkle and the dazzle of Sassy!! !